A Google image search will inspire you with many different designs. In The Avatar they had floating islands called the Hallelujah Mountains, and the animation Castle in the Sky has a huge castle on a floating island. What makes these floating islands able to ignore gravity? Try this defying gravity experiment at home. Please send us a screenshot of your floating island, or photos of your science experiment. Leave a comment telling us about your experiment. 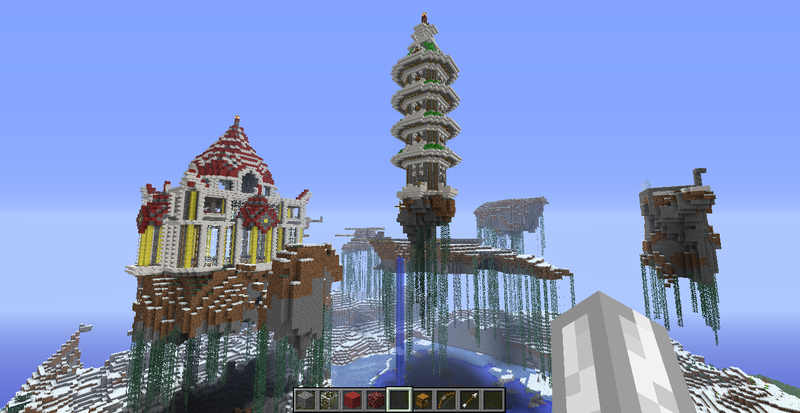 Here are some of mine on my MindcraftKids server. Here is Samuel's blog post on this quest: http://pridesamuel.blogspot.co.nz/2013/08/minecraft-club-competition-sky-islands.html A collaborative effort with Ethan and JJ.